Looking for something fun and memorable for your next birthday party, corporate function, school event or company promotion? 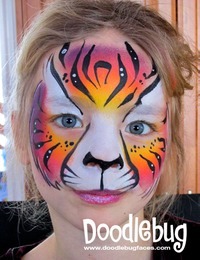 Look no further than Doodlebug Face Painting! Children of all ages (and their parents!) love face painting. A professional face painter can take your event to the next level, whether it is a backyard birthday party, a public festival or an in-store promotion. Created by Montreal face painter, mother and graphic designer Nancy Gervais, Doodlebug has been providing professional face painting services in Montreal and the surrounding areas since 2005. Professional, talented and creative, Doodlebug provides their clients with a range of full faces, mask designs and colorful cheek art which is limited only by your imagination!